After every crisis, the humanitarian community asks itself: “What have we learned? What could we have done more efficiently and effectively?” These are critical questions that, hopefully, allow each successive response to save more lives and help communities recover more quickly. 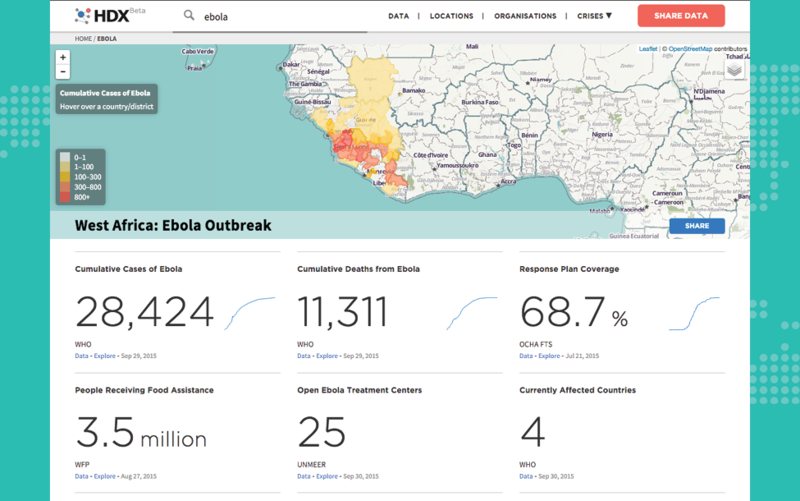 During the Ebola crisis, we saw many responding organizations sharing data at unprecedented levels in an attempt to contain the outbreak and help those affected. One platform, the Humanitarian Data Exchange, even attempted to bring all that data together in one place. It was a significant step forward in sector-wide data-sharing efforts. After the Ebola virus outbreak, many of us wondered how responses would have been different if NGOs had better internet access, and shared data more effectively. Would our response have been more impactful? What else could we have done, and what should we do next time? All of us involved in humanitarian and disaster-recovery work know that sharing information is a good thing. It helps first responders get medical care to those most in need, it helps NGOs and governments get the right supplies in the right places. But it’s not as simple as organizations sharing spreadsheets or databases – there are many barriers that stand in the way and prevent the improved response that we all want. Relevant data comes in many forms and from many places. Mid-crisis is not the best time to identify, collect or organize data, much less resolve the myriad questions around appropriate use, reuse and dissemination. Preparation is therefore critical – we can identify, collect and organize data before a crisis, and we can help responders and communities understand how data can be used to tailor effective responses. We can identify the crisis informatics that are likely needed by various stakeholder groups, and prepare the tools that are most promising in adapting response. These two steps alone would be a significant step forward, but it’s not enough. Perhaps the most significant issue around data sharing between organizations is a legal one. While more than half of the necessary information – roads, hospital locations – can be collected before a crisis, it’s almost always a chronic set of legal delays that prevent this data from being shared. The issues are varied, but most often the problems stem from the countless, often confusing, sometimes unclear or contradictory laws around data sharing. In these situations, organizations are understandably reluctant to share information, even when it could save lives. When every minute matters, organizations are rightly more focused on response, rather than working through legal details. NetHope, along with the World Economic Forum, the University of Washington, the Tableau Foundation, InterNews and Real Impact Analytics, is taking a first step towards answering these questions. We’re launching a joint project, which is focused on emergency response to natural disasters, and which looks to identify and eliminate known barriers before a crisis occurs. We will also work with first responders and local communities to equip them with the skills they need so that our collective actions can be better, quicker and more effective. In our upcoming efforts, we will attempt to address and answer some of these questions, and in doing so, build a framework for future efforts to improve response through better data use. We won’t solve all of the challenges nor remove all of the barriers, but with better preparation, we can narrow down the issues that we must address in partnership across the public, private and civil society sectors. That will be a big step forward in being better equipped to assist those in crisis, to save more lives and to rebuild communities impacted by disaster.